I pride myself as someone with relatively good taste and discerning enough to appreciate the finer things in life. Not that I am good at creating lovely things, but more of being able to recognise a well-designed item when I see one. During my moments of web-surfing, I sometimes chance upon some fabulous blogs. They exhibit such a refreshing style of artistic flair in the writing, layout or design that gets me all inspired. So much so that, I have decided to bookmark them at the new column I created at the left. So if you happen to know of any other design-worthy blogs, do drop me a line. 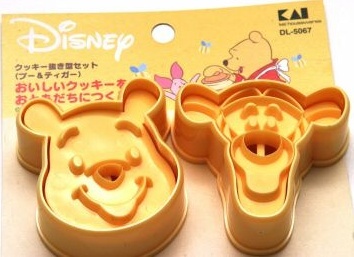 For now, do enjoy these. 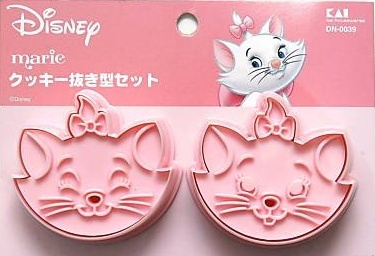 I bought these cute Disney cookie cutters at Carrefour last weekend and could not wait to use them in my next baking adventure. Big Buddy wanted the Winnie the Pooh series while Little Buddy loved the Marie ones – no surprises there since he has always loved cats. Finally too, I got to use my new cake mixer for the first time. It was such a breeze compared with brute arm power for the previous occasions. The buttery dough was very soft even after refrigeration so I added some floor to it so that it becomes less sticky. I also floured the cookie cutters so that the dough does not cling to it. 1. Cream the butter and icing sugar until creamy. 2. Add in eggs and vanilla powder. Beat well. 3. Fold in flour and baking powder. 4. Knead lightly, wrap in plastic wrap and refrigerate for 30 minutes. 5. Roll the dough between 2 sheets of non-stick baking paper until 5mm thick. 6. 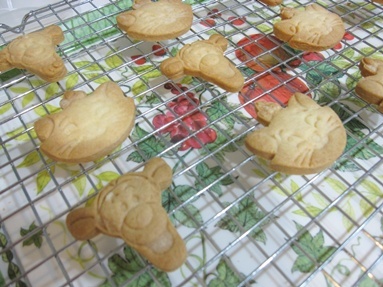 Use cookie cutters to cut into shapes and put them onto greased baking tray. 7. 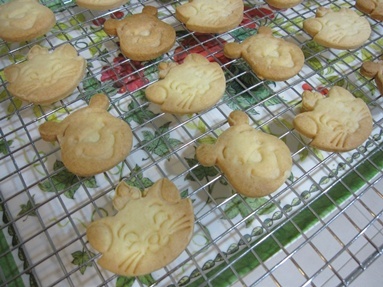 Bake at 160c for 20-25 minutes. Hey folks, go check out Mini Modern. 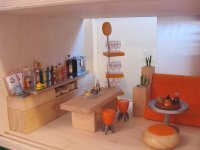 This is a fascinating website showcasing sleek mini room and house displays made up entirely of mini furniture and figurines. It is really amazing, the lengths and efforts the creator has gone to in order to setup each of those rooms. Here are some preview pictures of what's available. Absolutely exquisite and drool-worthy, are they not? After relying on arm power for a couple of times, I finally decided to pamper myself with a mixer. After my experience with the Steamed Sponge Cake, any mere thought of having to hand-beat or hand-whisk another bowl of batter really scares me off. Since I intend to embark on a conservative plan to bake at least once in two weeks, it may well be a reasonable investment considering the bargain price I got it for. 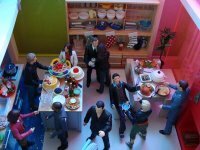 A cursory browse in any of the larger electrical stores will boggle your mind with various brands and their myriad of functions. Most of these high-end models will easily set you back by a couple of hundreds or even a thousand dollars. It will be madness for a novice baker like me to go for one of these Rolls-Royce mixers - I can hardly justify the expenditure! Brands like Kitchenaid and Kenwood will sit well in kitchens well-fragranced by the aroma of frequent bakes. My budget will instead be something less than $60, with as many functions as possible and made in an as-reliable-as-possible nation. It had taken me a few weeks of researching functions and plenty of price checks before I decided on the Philips Handheld Mixer HR1561. 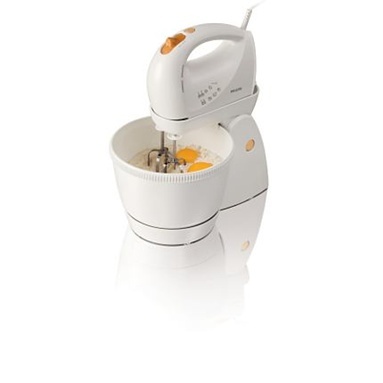 However, a quick pop into Best Denki today showed that the Philips Stand Mixer HR1565 was on sale at $62. When I next checked in with my regular electrical appliances supplier, I was offered an even better price than that. Good grief! What else can they do to further distinguish themselves with notoriety? The pediatrics clinic with bad service that I was ranting about earlier just scored themselves a further black mark in my book. On Tuesday evening, the usual pediatrician that my children see was closed so I had no choice but to bring Big Buddy to him. Big Buddy was in tears and complaining of pain at his ear/jaw area as he ate his dinner. Fearing a possible episode of mumps as I could feel a swell, Hubby and I decided to bring him to seek medical attention. The conclusion was that it could be a possible lymph node infection or a case of early mumps. So, on the safe side, Augmentin was prescribed as Big Buddy had two previous lymph node infections that resulted in incisions to drain abscesses that formed. When the nurse advised on the medicine dosage, something struck me but what it was did not register till we came home. Last night, I decided to do an online check on Augmentin and its recommended dosage for children as I had a hunch that something not right. I discovered that the amount prescribed Big Buddy (2.5ml) was way below the recommended range for children his age. I then dug up past records that I kept and confirmed that the dosage that he last took in 2008 was 7.5ml. This represents a huge disparity of 5ml so I called the clinic to seek clarifications. It was then that the attending nurse confirmed that the dosage advised us is in error and it should be 7.5 and not 2.5ml! Apparently the nurse attending to us that night made a mistake when typing the medicine labels. Although thankfully, the swell and pain had subsided, given Big Buddy’s history with lymph node infections, this is something that could have led to actions more drastic than oral medication being needed. I am shocked at the grave mistake made by the clinic. Granted that the doctor called me within short notice to apologise, I sure hope my feedback will result in his staff exhibiting better care and attention in this area. Hubby is a big fan of brownies and has been dropping hints for me to make him some. He often picks up those brownie pre-mixes on supermarket shelves, asking if they were any good. I really have not much confidence in baking, secretly wondering if a microwave oven can do a decent baking job. I have heard several comments about how dry cakes can get when baked in one. But when I came across this brownie recipe and saw the number of successful bakes achieved by various people, I felt I needed to give it a try. Since I do not own a measuring cup, I used the equivalence of 1 cup = 150g. 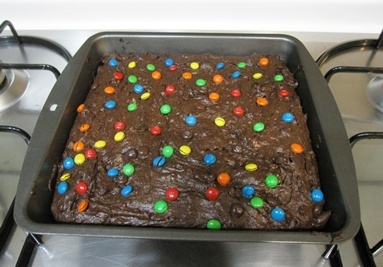 This recipe is really just about measuring and mixing before finally, my boys topped the brownie mixture with some mini M&Ms for decorations just before it gets sent into the microwave oven. This post not only marks my first bake but also the first food item churned out from my kitchen that I felt confident enough to present as a gift to someone not in my immediate family. I only intended to make some brownies for our own consumption but after seeing how chocolatey-rich it tasted, I decided to make a second batch for a close relative. 2. Grease and flour a 9 x 13 baking pan. 3. Mix together flour, baking powder, sugar, cocoa powder and salt. Stir to blend. 4. Add melted butter and eggs and mix thoroughly. 5. Add pecan nuts and mix thoroughly. Spread batter evenly into prepared baking pan. 6. Bake for 25-30 min in preheated oven. Cool completely in pan before cutting into 2 inch squares.